A recent forum post asked the following question: My guitar goes out of tune when I put on a capo. Is this normal? What can I do about it? Can this problem be worse on the lower frets? Does string diameter matter? The answer to all these questions is “yes”. Let’s look at why. Some capos can wreak havoc on tuning. When using a capo we are essentially fretting every string but often with more pressure than we need or would use with our fingers. That extra pressure increases the tension of the string and so the pitch will change a little. 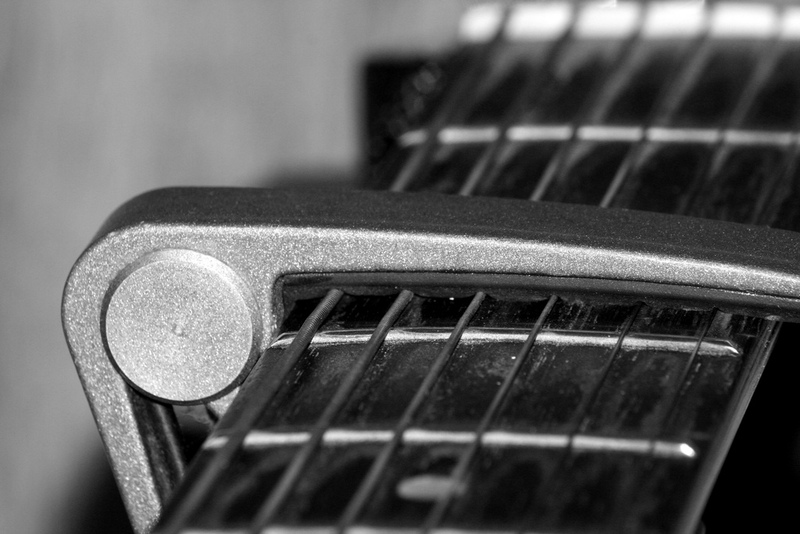 Some models of capo apply so much pressure that the pitch of the strings can be pushed very noticeably sharp. And even though the capo may be applying the same pressure to all strings, the guitar will sound out of tune as the strings will not change pitch by the same amounts. This is because each string has a different gauge and tension. The lower the tension of a string is, the more sensitive that string will be to going out of tune when the tension changes. This means that light gauge sets will suffer worse tuning problems than heavy gauge sets when we use a capo. But also note that if I perfectly tune all six strings and then apply the same amount of additional tension to each string, the strings won’t change pitch by the same amount. The strings with lower tension will have a larger change in pitch. The result is that the guitar is no longer in tune with itself. Notice the sharp ‘kink’ in the low-E and A strings over the fret, due to the excess pressure from the capo. Click to enlarge. Photo by James Savoie. For the strings used on most electric guitars (with unwound G-string) the pitch of the low-E and G strings will have the lowest tension and will be most affected by a capo. We tend not to hear the low string as accurately as the higher strings, so the G-string is frequently cited as the biggest issue. On acoustic guitars, the low- and high-E and B strings will be worst affected. But as the high-E and B strings have similar tension, they will have a similar change in pitch when the capo goes on. As they seem to stay almost in tune with each other, some people will again get the impression again that the G-string is to blame. Any tuning problems that we have with a capo could be even worse if the capo is used on the lower frets closest to the nut (e.g. 1st and 2nd fret). Particularly if the nut is too high (which is disappointingly common on many guitars) the strings will be stretched considerably before the capo presses them to the fret. Then there is added problem that some capos tend to ‘grab’ strings. If you are not careful while putting the capo on the strings can be pulled sideways by the capo. This is almost identical to bending the string and so tuning issues are a given. We must also be careful not to move the capo backward or forward (i.e. along the string), or even angling it, once it has been put in place. In this case the capo could stretch the strings in much the same way that classical guitarists’ vibrato technique does, and so again tuning will be affected. So what is the solution? The first thing is to try and avoid the problem as much a possible. Choose a capo with a tension adjustment and try to use the minimum tension necessary. You could also consider heavier strings, the higher tension of which will better resist the pressure from the capo and be less prone to tuning issues. Every time you install a capo, check your tuning after you put the capo on, not before. Be very careful with capo placement, making sure not to pull strings sideways. Once the capo is installed and you’re tuned up, don’t touch it as any change in position could pull the strings out of tune again.